Ribblesdale Wanderers made history when reaching the knockout stages of the Twenty20 competition for the first time. The Church Meadow outfit beat in-form Settle to progress from Group Two and then went on to see of Euxton later on in the weekend to set up a semi-final with Padiham in the Ramsbottom Cup. Ribblesdale managed to restrict the usually free flowing Settle batsman to 127-9. Although the home side made them fight all the way at the Marshfield Ground, Wanderers got home with three wickets in hand as paid man Primosh Perera top scored with an unbeaten 31. Read claimed the bragging rights against Padiham in the Twenty20 clash on enemy soil, edging the outcome by 16 runs. Paid man Matt Walker (pictured) made 58 off only 30 balls in an opening stand of 82 with William Wrathall. However, Read failed to make the final four of the Ramsbottom Cup. Thomas Turner’s unbeaten knock of 73, which included 11 boundaries, were the best numbers on offer for Read but Settle won by six wickets. 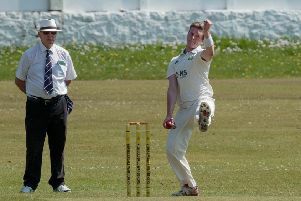 Salesbury did progress to the semi-final, beating Oswaldtwistle Immanuel by three wickets. Hashen Ramanayake was the hero as his unbeaten knock of 85 saw Salesbury surpass the home side’s finish at new Lane. Salesbury had previously lost out to Euxton in the Twenty20 while Whalley were beaten by Baxenden.